Compete at the highest level that I can. Last year I was so close to the championship game, but fell short of making the roster. It was the first game in 5 seasons that I didn’t start. This new opportunity was going to be my next challenge. Monday night I called one of the Blitz coaches to discuss this opportunity to try out with the Chicago Eagles. He ultimately said it was my decision and that I had to do what was right for me. No more waiting; it was decision time. I went to the Eagles practice, and it was a lot different from what I was used to. Everything was on a schedule down to the minute and it was a lot more organized, reminding me of when I played college ball. The Eagles players were nice, yet some looked a little confused to see a girl walking in with a helmet and shoulder pads. Former teammates welcomed me with open arms and said, “What up kicker?” Others who did not know me asked if I even knew how to kick a ball or if I had ever taken a hit in a game. One of the familiar faces was special teams coach, Scott Duvall. Coach Duvall is a great kicker and has a very interesting kicking background. Along with coming out of retirement at age 51 to play professional indoor football, he also holds the drop kick record for the Continental Indoor Football League (CIFL) and is a straight-on kicker. Trying out was not going to be easy. The Eagles have two very good kickers, David Tomis and David Winn. We warmed up and then started doing some charting. Charting is where the coach watches closely on your kicks and marks down whether you made it. We started with extra points and then moved back to 45 yards. I didn’t have my best showing, but at the end of practice on Tuesday night, Head Coach Arvanitis welcomed me to the team and invited me to come back for Thursday night’s practice to compete for a roster spot. I kicked a little better on my second tryout with the Eagles. Still a little off, maybe it was the nerves of being in a new environment. The game day roster was announced via email late Thursday night after practice. I received the email. My name was not listed. It sucked, but I knew going into this that I would have to work hard and earn it. The Eagles played against the Omaha Beef while the Chicago Blitz (my former team) played the Northern Kentucky Nightmare for the second time. I went to the Eagles game, but I had my eye on the Blitz updates throughout the game hoping they would bounce back with a much needed win and they did! 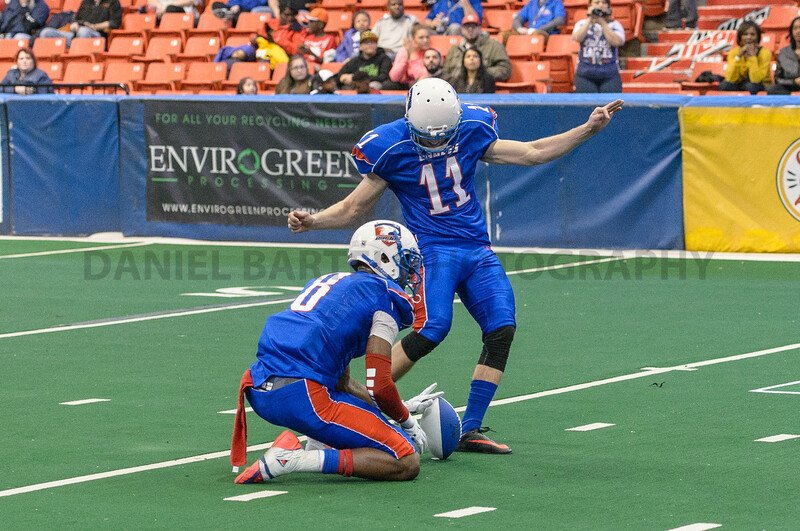 The Blitz signed Igor Materic as their new kicker. This was Igor’s first Pro Indoor game and I was excited for him and to see how he did. 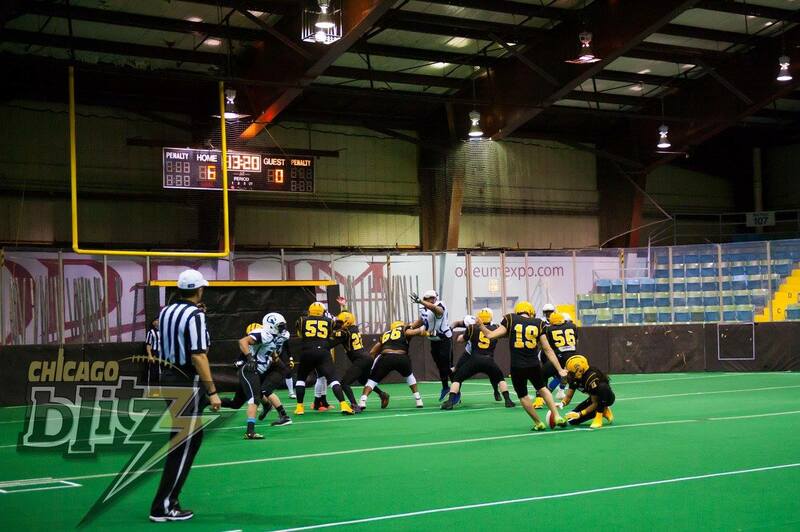 Igor did not disappoint going 4-5 on extra points and 1-2 on field goal attempts. The Eagles also came up with a very important win. It was a close game ending 49-48. They battled to the very end. The offense, led by QB Anthony Iannotti, set the pace with a touchdown pass to wide receiver Stacy Howard, who went over the boards to make the play. The defense stepped up and made the stops they needed in the 4th quarter. The special teams played an integral part in the win. With great blocking by the offensive line, Chris Muhammad’s beautiful snaps, and Stacy Howard’s perfect holds, kicker David Tomis hit all of his extra points and got some great bounces on the kickoffs resulting in touchbacks placing the Beef on the 5 yard line twice in the 4th quarter. Although it was tough to sit in the stands, it was fun to see friends and teammates from both teams come up with big wins. This different perspective also was a nice reminder for me to push myself to keep working harder. The Chicago Eagles host the Sioux City Bandits at the UIC Pavillion Saturday, April 16, 2016 at 7pm. 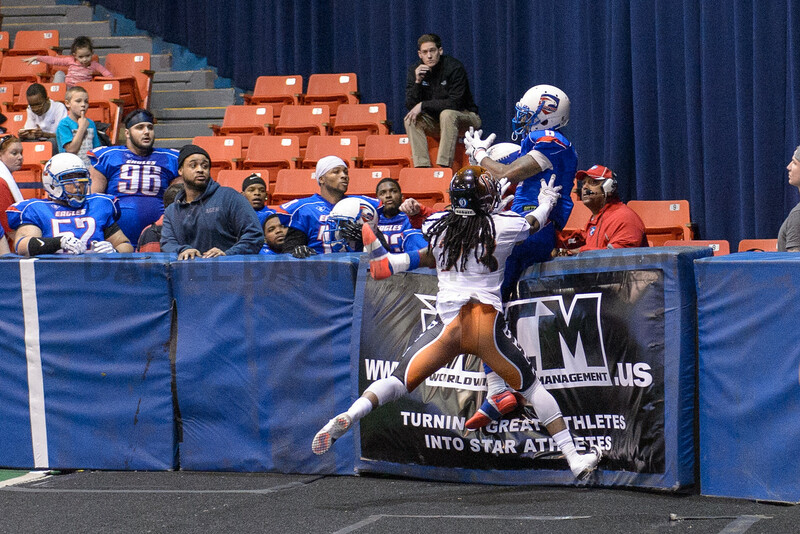 The Chicago Blitz have a bye week and return April 23, 2016 to face the River City Raiders at Family Arena in St. Charles MO. Follow me on Instagram @julieharsh or Twitter @julieharsh99. Julie is a graphic designer. Outside of work, she dedicates her time to sports. She coaches and plays soccer, along with being a kicker for several football teams. She is currently kicking for the Chicago Eagles, a professional indoor football team and a member of the Champions Indoor Football League (CIF). Follow Julie on Instagram @julieharsh or Twitter @julieharsh99.